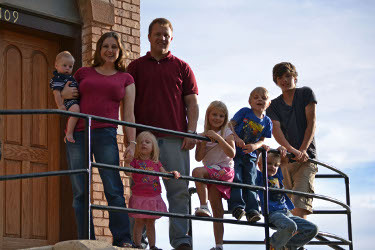 My kids are on Fall Break and we have been traveling, visiting family. I brought my laptop and some videos to edit and upload. Unfortunately, first I was just having problems getting online and now my laptop is dead! So hopefully when we get home my husband can get all the data off of it so I can share my video tutorials. I will be sharing some fun photos on the HIMCR facebook page from our trip. I'll probably post some here too when I get home and to my PC! The good news is that I DID completely get the challenge post ready and scheduled to post before we left! So a new challenge will still go up first thing Saturday morning! I think you will like this one! Thanks for all the response to last week's challenge: Mix it Up! Halloween!! So far we have over 30 wonderful entries! You guys are sooooo talented!! The challenge for this week, the 4th week of the month, is MIX IT UP! The Mix it Up Challenge this month is to make a Halloween card! If you don't make or celebrate Halloween then just make a card using traditional Halloween colors: Orange, Purple, Green, Black, and/or Gray. Just have fun! You have until Friday night, September 30th, to link up your creation to get entered into the monthly drawing. FYI, This is the last week to get entered into the September giveaway!! The Orange Frame was cut from Cricut Essentials (on the E2) at 4". Cat was cut from Halloween Hauntings at 2.5"
Card front: Simply Chartreuse 4" X 5 1/4"
I'm in a wonderful blog group with some talented ladies: Papertrey Paper Dolls. We take turn hosting challenges that get posted usually every other week but, like me, most of us have been super busy lately and the challenges haven't been going up as often. However, the challenge links stay up for a long time so be sure and check them out! Anyway, I thought I would take this opportunity to get a few challenges done. I'm not going to be able to go back and do all the ones I've missed but I did get three done with this ONE card!! The challenges were #42 Rolled Flowers, #44 A Inspiration Photo challenge ( a true challenge for me! ), and #41 Use Twine. Flowers were cut from Flower Shoppe Cartridge at 2 1/2", 3", & 3 1/4"
Card front: Aqua Mist 4 1/8" " X 5 3/8"
Ink: Crumb Cake, Cameo Coral which matches Berry Sorbet PERFECTLY. See a PTI and SU Color Comparison Chart HERE! I haven't done a MojoMonday sketch challenge is so long! I decided it was time to! What a fun sketch! Scallop on the left was cut using Fit to Length at 3". Scallop on right was cut at 2.5". Sentiment image layers were cut at 2.25". All were cut from Art Philosophy! To order yours and see what all comes with the Cricut Art Philosophy Bundle go HERE! I'm just a happy customer with a great CTMH consultant!! 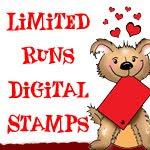 Also, just a few more days to get the stamp set of the month for only $5 and an extra double set FREE!! Only through the end of September!! I got one and it's adorable! Card front: Pool Party 4" X 5 1/4", DCWV 3 3/4" X 5"
The colors used are for the Splitcoaststampers Color Challenge from last Tuesday (09/13/11): Peaches Poppies and Pools . While you're here be sure and check out the current HIMCR Challenge and Giveaway! The challenge this week, the 3rd week of the month, is Try a Technique! The technique for this week is Altering!! I have altered a tin but you can alter ANYTHING! A tin, a composition notebook (you can see my latest HERE), a bucket, a picture frame, you name it! I even altered some Papertrey Ink packaging to make a cute gift. You can see it HERE. Just find something and start putting paper, embellishments, paint, whatever on it!! With Christmas / Holiday season right around the corner it's a perfect challenge to kick start us getting some gifts ready. You have until Friday night, Semptember 24th to link up your creation to get entered into the monthly drawing. You can see the September giveaway by clicking on the 'Current Giveaway' button on far right. For a template to cut out the notch and top for a tin go HERE on Splitcoaststampers. First apply Mod Podge where your first layer will go. The top can be painted, but I choose to apply paper. Apply top the same as the sides. I propped mine up so the top could dry and the handle not touch the drying glue. After it dries apply any embellishments. Reindeer cut from Create A Critter at 3 1/2". Can't wait to see what you come up with!!! I've finally gotten my husband back to work! I miss having him around to visit with, eat lunch with, run errands with, watch and discuss court TV with...... However, I have to get myself back to a schedule and get my house back in some kind of order. Here's the September Monthly Giveaway! Some fun Autumn and Halloween stuff! Remember to check out this week's challenge and get a creation done and linked to enter the drawing. This week is Super Scraps Saturday! Check it out HERE! You will have two more weeks or chances to get entered. New challenge will go up Saturday! You can see the HIMCR schedule of challenges and guidelines HERE! Congratulations Paula! Please use the 'Contact Me' button to send me your shipping info so I can get this sent to you!! Another big shout out to my CTMH lady from The Craft Closet who donated this fun giveaway! Thank you Angela!! In my Saturday post I completely forgot to put the challenge link or even mention that is was our Super Scraps Saturday: Challenge #11 and that seems to be the one you all like the best! Or at least that's the challenge that gets the most entries. I'm so glad that everyone likes having an excuse (a challenge and a chance at a prize) to get those scraps out!! I know I do too! 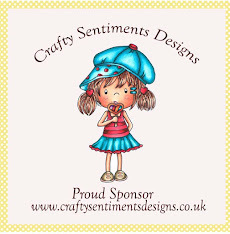 If you want to check out my Super Scrap Saturday card go HERE! Or just look at my last post which was Saturday! AND I haven't forgotten about the September Monthly Giveaway. You want to see what you are entering to win, right? I just wanted to get the current CTMH Stamp Set Giveaway finished first then I will get the NEW one up! Today's the last day to get into that drawing. So check it out!!! All you have to do, if you haven't already, is go the post and leave ONE comment! Who doesn't like to win FREE stuff! 2. When posting your creation on your blog or online gallery please link it back to here to this challenge. This helps to spread the word and the FUN! PHEW!!! I think that's it - FOR NOW!! I hope a little later today to get some crafty time, but it is Monday! Last night we had our monthly crop that I hadn't been to in a quite a while. It was soooo much fun! I didn't get much accomplished though, as usual! Well, this time at least I have a good excuse! It was POURING down rain when I got there and so I didn't take my stuff in at first. Last night was the annual swap where we get to take our unused items and sell or if your like me just take some cash and buy, buy, buy!!! LOL!! So I just spent the first part of the night checking out what everyone had for sale and eating snacks! Then my husband brought the baby by for me to nurse then after that I got busy! Sortof! Fireman and layers were cut at 4" from Everyday Paper Dolls. Card front: Yo Yo Yellow 4" X 5 1/4"
Accessories: Cuttlebug & SU Square Lattice & Checkerboard embossing folders , Cricut & Everyday Paper Dolls, scrap ribbon from my bin that I carry EVERYWHERE! The Cropchocolate Focus Group were challenged to make something using handmade embellishments. I immediately thought of those fun looking flowers on the Cricut Art Philosophy Cartridge!!! The floral panel was cut at 7". 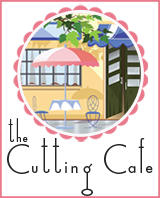 The journaling image was cut at 2". Both from the Art Philosophy Cricut Cartrdige! I cheated on the letters! They are 'thickers'. Flowers were cut at 3", 4 1/2", & 3 3/4". These were a lot of fun to make! All the consumable materials used are from http://www.cropchocolate.com/. 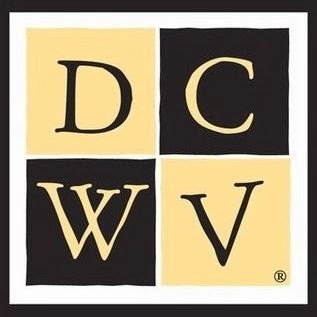 Check out their yummy daily deals! Sherry Brown from Patterns By Sher!! Congratulations Sherry! I think I have your contact information but just to be sure please use the 'Contact Me' button and send me your shipping info! 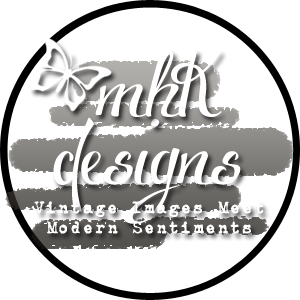 Don't forget to check out the current challenge to get entered into the September giveaway and the current GIVEAWAY: A CTMH Stamp Set! There's a lot going on in this post, and I hope everything will make sense. Please don't hesitate to use the 'Contact Me' button to ask any questions you might have. First, here's a video tutorial using the New Close to My Heart Cricut Cartridge 'Art Philosophy' and the 'A Holiday' Stamp set which is the stamp set up for the giveaway! 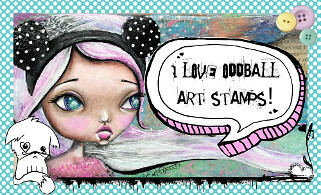 This is another stamp set that coordinates with the 'Art Philosphy' cartridge! I'm loving it! With the 'Art Philosophy' Cricut Cartrdge and the coordinating stamps it makes making cards for quick and easy! AND pretty cute too!! Sentiment cut out was cut at 1 1/4". See video tutorial for how I figured the right size! Holly and berries were cut at 2 1/4". 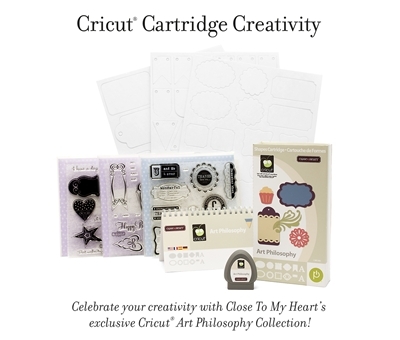 Here's how to get the BRAND New Close to My Heart's Cricut Cartridge Art Philosophy Collection! Right now there is an AMAZING special going on! The Art Philosophy cartridge bundle pictured below is only $99 AND when you spend $75 you get the stamp of the month set for only $5!! Plus, if that wasn't enough through the end of September you get a cute double stamp set FREE. 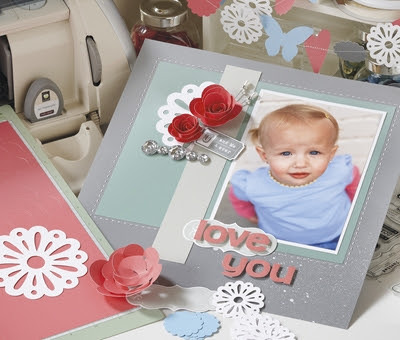 Go here for all the details and to get yours today: The Craft Closet. 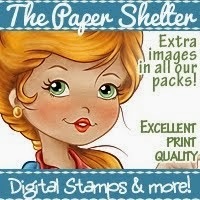 Be sure and let them know Laurie sent you and thank her for the awesome stamp set giveaway! I'm not affiliated with CTMH, just a very happy customer! Here's a picture of the Close to My Heart 'A Holiday' Stamp set giveaway! Isn't it the cutest! To get entered into the drawing just leave ONE comment below! I will be using Random.org to pick the winner and be posting it next Tuesday! Thanks so much for checking in today!! Happy Saturday! I hope everyone is enjoying their holiday weekend: Labor Day! Three Day weekend! YEAH!! It's the 1st Saturday of the month! Time for a Color Challenge! I can't believe it has been 10 weeks since I started doing challenges. How time flies! These are Stampin Up colors but you can use any brand! You have until Friday night at midnight, September 9th to link up your creation to get entered into the monthly drawing. I will get September's giveaway pictured and posted a little later. Monkey and the Vine were cut at 3 1/4" from Creat a Critter. The sentiment layers were cut at various sizes from Art Philosophy. Card front: Chocolate Chip 4 1/8" X 5 3/8", DCWV Twinkle twinkle little boy 4" X 5 1/4"